A black mare, now belonging to Daniel Yeulett, a carrier, at Winslow, has travelled from that place to Buckingham for the purpose of taking coals, &c, twenty four years and a half. She has averaged nine times in each week; it being seven miles from Winslow to the new wharf, the amount of miles is enormous – being 160,524. This rare old animal still continues her labours. The old mare belonging to Mr Yeulett, of Winslow, whose wondrous performance was noted in our last week’s paper, in which it was stated that "she was still on the road," is erroneous – she died on Friday morning, just before that number went to press. The poor nag was fetching coals to Winslow from the New Wharf on the Canal beside the Stony Stratford Road in Buckingham. These pieces show just how much coal was brought to North Bucks by the Buckingham arm of the Grand Union Canal that opened in 1801. Before that time, there would have been no coal available in Winslow, excepting small quantities brought by wagons, at a very high price. The Yeulett family ran their carrier business in Winslow for several generations. Kelly's Directory of 1854 says that their waggon went to Buckingham via Adstock and Padbury four days a week.They sold beer in Sheep Street from the premises which are now no.17, and were known as the Black Horse from at least 1861, probably in honour of the famous mare. As there are no other references to Daniel, he was probably the same person as George (see below). One of the family was a crack shot in the Volunteers. In the 1861 census John Yeulet aged 23 was recorded as "Lab (wharf)", so presumably worked on the Canal in Buckingham. One of the Brackley police, […] went from Buckingham to Winslow with Mr. D.Yeulett, the Winslow carrier. From enquiries made as to the no. of miles he went in an hour? Whether his was a van or a wagon? &c., Yeulett supposed he intended informing against him; he therefore refused to take 6d (2.5p) of him when he got down at Winslow; he then said “Oh you keep a public-house,” to which Yeulett replied “No, his was a beer shop only,” and directed him to it. The gentleman then went and very pressingly endeavoured to persuade Mrs Yeulett to let him have gin, rum, brandy or even some home made wine, or even to send out for some for him; but the good woman was proof against all entreaty, and thus preserved her money. It is the duty of policemen to use some craft to ascertain where unlawful practices are supposed to exist, for public report or information; but it is very wrong that any person should be decoyed into the commission of an offence against excise laws. Mr. and Mrs. Yeulett were too respectable to be the victims on this occasion. There was a strict speed limit for all horse-drawn wagons on public roads. It was 12 m.p.h for stage coaches. Once, engines on wheels started to proliferate, things got tighter. The Locomotive Act of 1865 reduced the speed limit to 4 m.p.h. in the country and 2 m.p.h. in towns. The Act required a man with a red flag or lantern to walk 60 yards ahead of each vehicle, enforce a walking pace, and warn horse riders and horse drawn traffic of the approach of a self-propelled machine such as a traction engine. According to the Return of Public Houses of 1872, the Black Horse had been licensed since 1832 (not necessarily under that name). In 1841 (see census return) it was the home of George Yeulet, carrier, aged 49 and his wife Elizabeth aged 33. There is no reference to it being a beerhouse in the census, but George was listed as a beer retailer in 1853 and Elizabeth in 1877. In 1861 George called himself a farmer and coal merchant employing 4 men and 2 boys. He died at “the Black Horse Public House” on 27 Aug 1862. Elizabeth died in 1881 aged 74, and in the census of that year the Black Horse was occupied by her son James, aged 35, a brewer. The Black Horse (described as "A HOUSE occupied by Mrs. Yeulet") was included in a sale of Selby-Lowndes property in 1875. In 1881, the premises were put up for sale by Dudley & Son and Geo. Wigley (click on the image to see a larger version). The pub had front and back parlours, tap room, three stables, cart shed, brewhouse, walled garden, and four bedrooms in all. It failed to sell and was “bought in” for £440, but Thomas Walker, a master bricklayer, bought it for £340 later in the year. He was there in 1889 when he appeared to testify in court as some boys were convicted of obstructing the footpath in Sheep Street. In 1891 he was listed there as builder and licensed victualler. On 11 Jan 1893 William Walker was given a temporary “holdover” of the licence. Edward Lines was granted the licence in Nov 1899, and in the 1901 census he was listed there as publican, aged 27, born Chipping Warden (he was later the town crier). In 1911 it was Albert Amos, publican, aged 42, and it was said to have 6 rooms. Kelly's Directory of 1924 lists John Alfred Gillam as beer retailer in Sheep Street, presumably at the Black Horse. The Gloucester Citizen of 23 June 1927 reported: "Licensed in 1832, the Black Horse Inn, in Winslow, is to be closed as redundant". 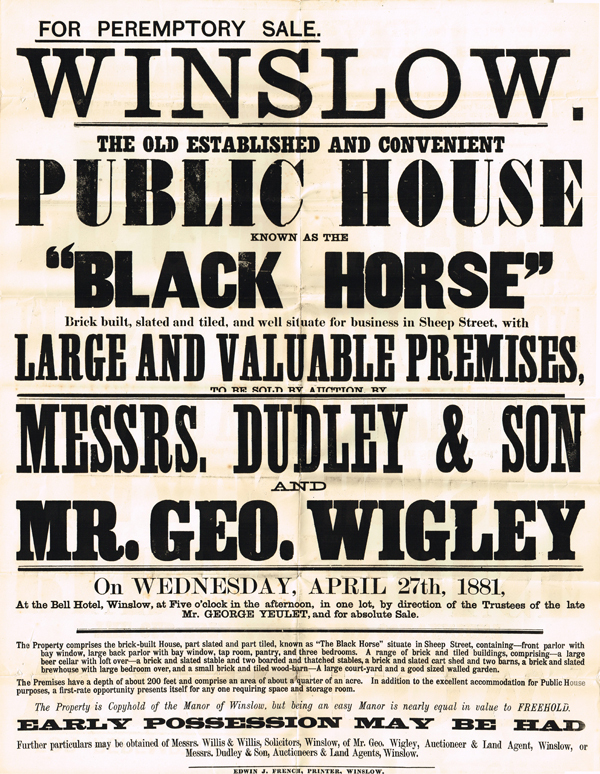 No opposition was offered to the closing of the Black Horse, Winslow. The tenant, Mr Gillam, said that he had no objection to the application, but would ask for compensation. Supt. Callaway said that the house had a licence for beer only and had been held by the present tenant since February, 1913. The owner was Mr McCorquodale, who purchased the premises last year. The house was first licensed in 1832. The licence was redundant and the trade was small. The licensee was recalled and questioned by the Chairman as to the trade of the house. He said the takings were about £4 weekly, - compensation was fixed at £200.